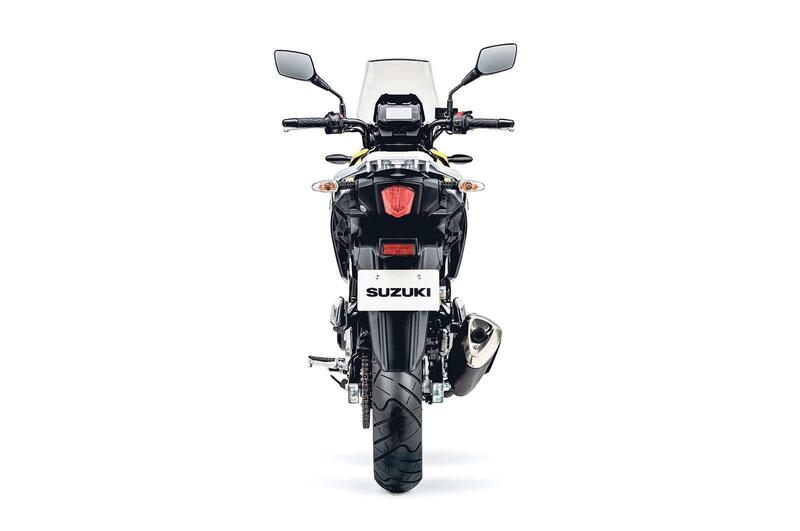 Suzuki’s DL250 V-Strom is more at home on the day-to-day commute than big mile adventures. While the bike looks fantastic and bigger than simply a 250, it is much too underpowered to be fully considered as a tourer and, while it performed well on light off-road, it's far better suited to life on the tarmac. It's friendly, forgiving, and kind on your pocket – perfect for nipping from A to B. Although I am a complete virgin to off road riding, I found the bike well balanced and perfectly capable travelling down the two-mile stretch of mild green lane on our route. The IRC tyres gripped the surface well and once I’d stopped trying to ride it like I was on the road, it inspired enough confidence for me to stand up on the pegs (whatever that’s supposed to do). Back on the tarmac, the conventional front forks feel perfectly firm for everyday road riding and offer enough confidence to lean the bike over in the bends. The pre-load adjustable rear shock feels a bit soft on standard settings, but manages to keep the bike feeling well planted and capable of being chucked around with confidence. The turning circle is also very good and there is plenty of lock to inspire full U-turns in the road with your feet up. At the heart of the V-Strom 250 lies the same basic non-threatening 24.7bhp 248cc parallel twin engine as you get in the new sportier GSX250R. Based on Suzuki’s ageing Inazuma lump, the easy-going nature is ideal for new riders, however it wouldn’t take long to master, before leaving riders yearning for more grunt. 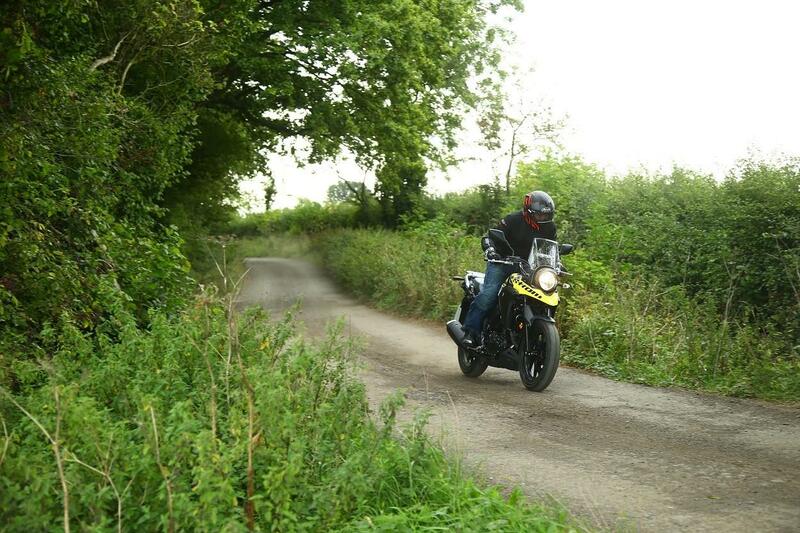 From an experienced rider’s standpoint, the electrically quiet V-Strom feels quite underpowered for its size. It will sit at 70mph all day, however really starts to struggle when pushed further. 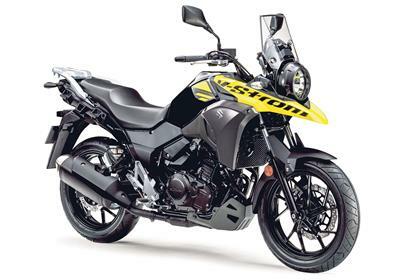 The bikes ridden at the launch had none of the optional luggage attached either, which suggests that once fully laden it would simply be unable to be used as the low-capacity adventure-tourer Suzuki claim it is. Like much of Suzuki’s small-capacity range, the 250 does struggle with a stubborn gearbox, refusing to click into first from neutral on multiple occasions. In the end, it was easier to leave it in first when stationary, for fear it wouldn’t clunk back in when it was time to get moving again. I was also disappointed to see that Suzuki’s one-touch easy-start system wasn’t included on the 250. Both the new GSX-R and GSX-S125 have this feature, as do bikes like the SV650, so it’s questionable as to why this bike was missed out. Its low seat height, lightweight clutch and fantastic MPG figure make it the perfect machine for traveling in and out of the city centre for minimal cost. The engine simply needs a slightly bigger displacement to tour easily and there are bigger bikes in the A2 class that can already service this requirement more comprehensively. There are a few neat touches of note on the 250 V-Strom as standard. At the rear, there’s an aluminium carrier mount, capable of taking 8.5kg. There are also integrated hooks down the sides, ready for the instillation of the optional panniers or hooking straps. Should you wish to go off road, there’s a sturdy bash plate to help protect the sump too. The finish on the glossy paintwork is lovely. Suzuki offer the 250 V-Strom in three colour options and it looked resplendent in the mid-morning sun. 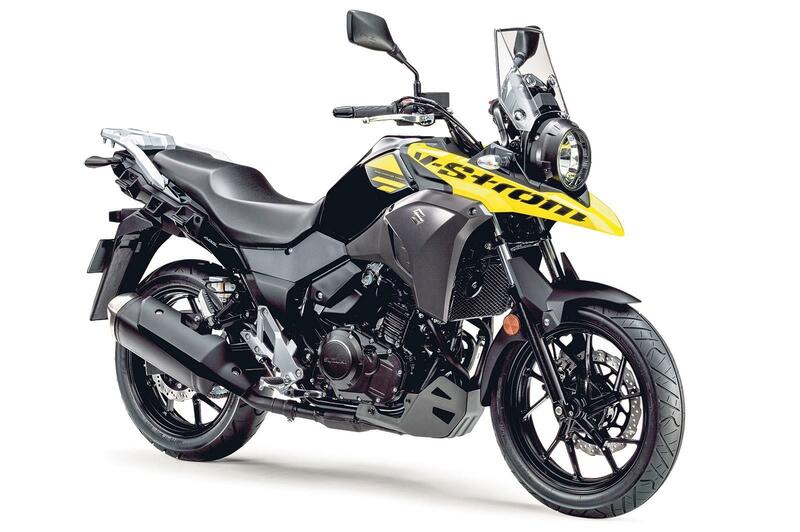 Again keen to highlight the adventure-nature of the bike, Suzuki claim the yellow and black scheme pays homage to their past success in the world of motocross. 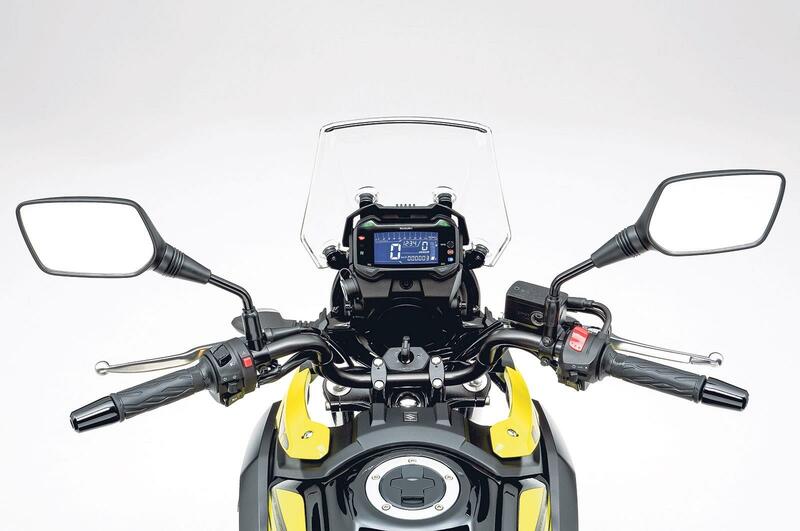 According to its digital dash, the 250 will return in excess of 70mpg after spirited riding. It’s also the cheapest in class, meaning those wanting a low budget run-around should look no further. The money saved over its rivals could also go into buying accessories. Sitting on the V-Strom is a nice place to be. The upright bars are appropriately placed for long-distance journeys in comfort and the seat has plenty of padding for long stints in the saddle. The bike is also feels very roomy and the pegs are perfectly placed for my 5ft 7in frame. There’s a lack of visible tacky plastic and the addition of a metal tank means you can fit either a magnetic or strapped tank bag, should you so wish. At faster road-going speeds though, the nonadjustable screen becomes a pain. It is simply too small to be of much use and wind buffeting soon becomes a factor to contend with. 1 owner has reviewed their SUZUKI DL250 V-STROM (2017-on) and rated it in a number of areas. Read what they have to say and what they like and dislike about the bike below. Does what it says on the tin . A good all-rounder. There's no vibration at low speeds but it does runs out of puff at 65mph. It is no speed-machine, it's for long rides to work and see the country side at weekends. All day it's comfy and there's no vibration, but it is very slow with two people on as there is not enough power. It's like a sewing machine, it's sweet and quiet but lacks power. Service costs are high because of a valve check every time it's serviced. It's recommended by Suzuki to do this, which in my opinion is unnecessary. I would recommend putting a top screen on the one that's there, to stop buffeting from the wind. And a top box, not the one from Suzuki as it is very expensive. 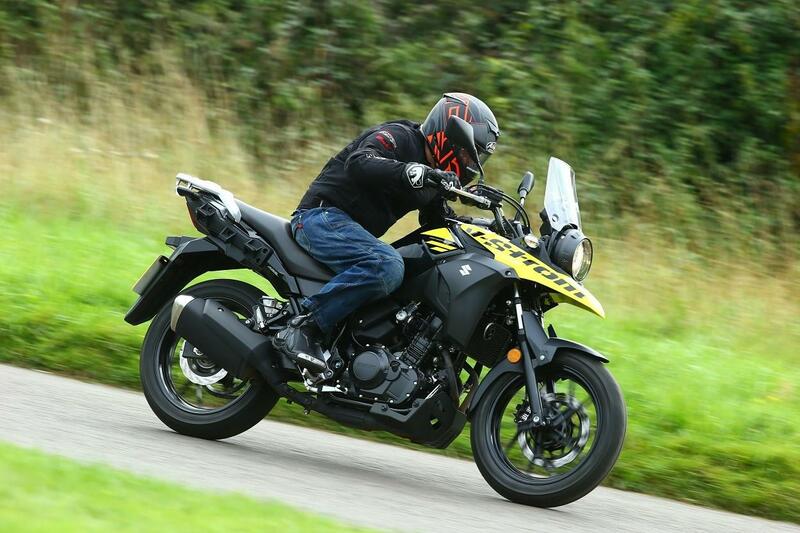 I test rode it at the dealer and fell in love with it, so I bought the test bike and saved £500 off the list price . Does Suzuki’s DL250 V-Strom cut it for adventure?